DATA PROTECTION AND PRIVACY Internet, Artists This case arose out of a simple set of facts. A religious instructor for the Swedish Church, Bodil Lindqvist, posted up webpages on her home computer which were aimed to help parishioners prepare for their confirmation. The administrator of the Swedish Church’s website provided a link from their website to the defendant’s webpages at her request. The webpages contained information about colleagues of the defendant with first names and in some instances full names, address and telephone numbers. The defendant also remarked that one colleague was on half time work because of medical reasons – she had injured her foot. The web pages were mildly humerous but the defendant had not asked for permission from any of the parties featured. She also had failed to notify the Datainspektionen, the relevant Swedish supervisory authority, of her activities. The Defendant was charged with (i) processing personal data by automatic means with notification to the relevant authority (ii) processing sensitive personal data without authorisation and (iii) transferring the data to a third party [via the internet].The Gota Hovratt (Court of Appeal, Gota) referred the case to the European Court of Justice for clarification of EC Directive 95/46/EC…. TRADEMARK Record labels, artists, internet Apple’s new and successful online music store, iTunes, which recently sold its ten millionth download at 99cents, and the Apple iPod, face a legal challenge from Apple Corp, the management company and record label behind the Beatles which was set up in 1968. Apple Corp, based in London, have served papers in the High Court seeking injunctive relief and damages to prevent Apple Computers using the word “Apple” and the Apple Computer’s logo in relation to iTunes and the iPod. It seems that now the Computer company’s activities have spread into the ‘music’ business, Apple Corp is seeking to protect its own business reputation, goodwill and name and is relying on an earlier 1991 agreement it reached with Apple Computers which purportedly prevented Apple Computers using the name Apple or an Apple mark in the music business. Apple Computers were set up in 1977 and the name is allegedly Steve Job’s tribute to the Beatles. The 1991 agreement (which itself was a result of previous litigation over a previous agreement) resulted in Apple Computers agreeing that their use of the Apple name and logo would be restricted to use with computers and never with music…. 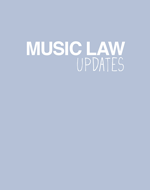 COPYRIGHT Artists, Record Labels A California judge has dismissed part of Michael Jackson’s lawsuit against Universal Music in which he claimed he was owed royalties for songs he recorded before 1979 (see Law Updates, June 2003). In a January 1980 settlement with Motown, Jackson gave up rights to songs released before 1979, giving the record label exclusive rights to the name the Jackson 5, the group of Jackson-family members that first put the star on the map. Jackson contends he should be paid for any songs he recorded alone or with his brothers that were re-released after the 1980 agreement. Jackson is seeking payment of royalties he claimed are owed and recission of the 1980 agreement. Los Angeles Superior Court Judge Emilie Elias found on Friday that Universal had not breached any fiduciary duty, since Jackson gave up the rights to the pre-1980 tunes. TRADE MARK, COPYRIGHT Artists, Merchandising A reunion concert featuring two original members of the Doors has prompted a law suit from original drummer John Densmore in the Los Angeles Superior Court for breach of contract and unfair competition. Original keyboardist Ray Manzarek and guitarist Robby Krieger have teamed up with vocalist Ian Astbury (formerly of the Cult) and Stuart Copeland, drummer with the Police, to play a concert in Los Angeles. Densmore claims that the band’s name is owned as a partnership by the three living members and the late Jim Morrison’s wife, Pamela Courson and that each partner has a right of veto over use of the name. He claims that the ‘new’ Doors are misusing the band’s name and logo and will confuse the general public. Recent cases in the UK involving the use of original band names have included Sweet and Bucks Fizz. Seewww.news24.com/News24/Backpage COMMENT : This area of law has recently been explored in the UK by the High Court in the case of Byford -v- Oliver and Dawson (2003). This case involved the use of the name ‘Saxon’ by Biff Byford, the original singer with the British heavy metal band. Byford had been a band member since its formation in the late 1970s…. CATHERINE ZETA-JONES AND MICHAEL DOUGLAS BEGIN ACTION AGAINST HELLO! PRIVACY LAWS Artists The action brought by Michael Douglas and Catherine Zeta Jones reached the High Court in London. The couple and Northern & Shell, publishers of OK, have brought an action against Hello! claiming that their privacy was invaded when a photographer secretly took pictures of their New York wedding and provided these to Hello! who then published the shots. The couple had an exclusive agreement with OK to publish official photos. The UK has no real body of privacy law and recent cases by celebrities such as Naomi Campbell (against Mirror Group Newspapers) and footballer Gary Flitcroft (A -v- B & C ) have done little to develop the right to privacy set out in the Human Rights Act 1998 with the Court of Appeal giving a very wide definition to what the ‘public interest’ might be. Mr Justice Lindsay must have further alarmed the couple by stating in court that in the UK weddings must, by their very nature, be ‘public’ events as part of the ceremony involves asking members of the public if they know of any just reason why a marriage ceremony should not take place.